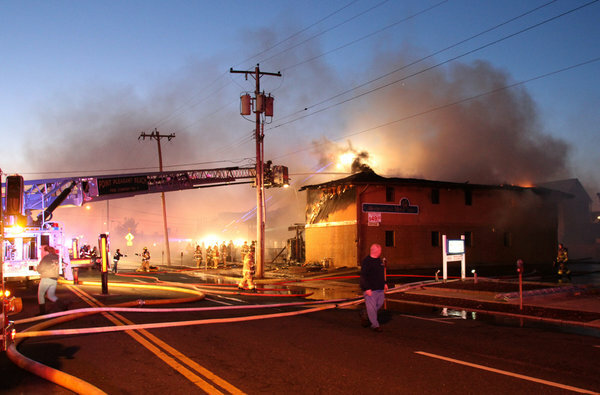 A fire swept through a motel at Point Pleasant Beach on the Jersey Shore just before dawn on Friday, killing four people and injuring eight others. The two-story wooden motel, two blocks from the beach, was a popular destination for tourists during the summer. But it had also become something of a home for families still displaced after Hurricane Sandy. Crystal Wardell, 26, was asleep in a first-floor room at the motel, the Mariner’s Cove Motor Inn on Broadway, when the fire started just before 5:30 a.m. The six members of the Wardell family staying at the motel were forced out of their rented home by Hurricane Sandy, which struck in October 2012, and have been staying in temporary lodgings ever since. They were living in two rooms, paying about $200 a month for each room. When Ms. Wardell realized the building was on fire, she rushed to her grandfather’s room. He has dementia and uses a wheelchair, she said, and was so disoriented that he was fighting with people trying to help him. Ultimately, the police came and carried him out. A. J. 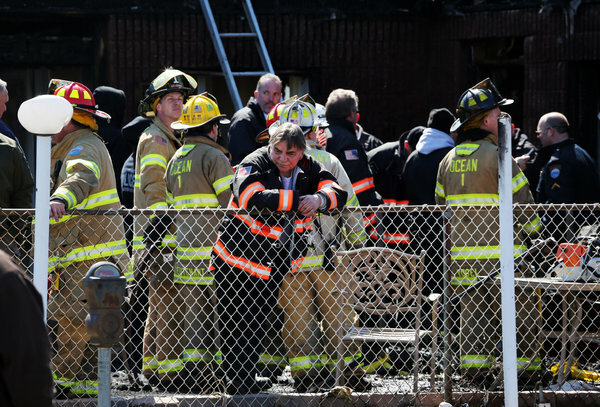 Fox, the chief of the Point Pleasant Volunteer Fire Department, said that a half-dozen local fire departments rushed to the scene but that by the time they arrived, the entire structure was ablaze. Firefighters tried to break through windows on the upper floor to get to trapped guests but the flames were too intense. They were able to save one woman there. “One of our firefighters from Point Pleasant Beach noticed her in the window,” Chief Fox said. She was on the second floor and sought shelter in a bathtub with the shower running, he said. Firefighters used a ladder to reach the window, broke the glass and doused the flames around the tub. 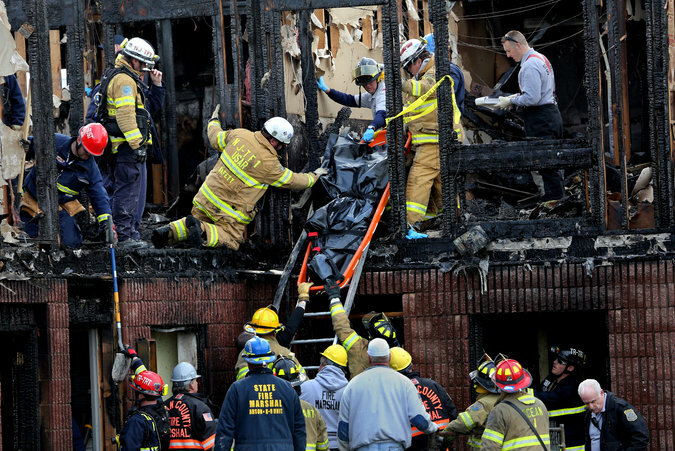 One firefighter pulled the woman from the flames; another took her down the ladder. The woman was hospitalized with serious burns. “I think she helped save her own life,” Chief Fox said. Early Friday, the Ocean County prosecutor, Joseph D. Coronato, said that the cause was under investigation and that officials were sifting carefully through the wreckage because 10 guests could not be located. Shortly before 4 p.m., officials said that the last body had been recovered and that they were shifting their focus to the investigation. Al Della Fave, a spokesman in the prosecutor’s office, said all the victims were men, but he did not release their names. As the fire burned, the roof collapsed and the manager’s office was destroyed, making it difficult for rescue workers to determine if there were more people who had been trapped in their rooms. The fire was brought under control shortly after 7 a.m. Investigators were eventually able to pull a hard drive from the computer in the manager’s office, get a complete record of who was at the motel and make sure no one was unaccounted for. The motel had 25 units and could accommodate 100 people. Mr. Coronato said officials believed that about 40 people were in the motel at the time of the fire. A former manager at the motel, who spoke on condition of anonymity because he was not authorized to discuss the motel, said his uncle owned it. He said the motel suffered five feet of flooding during Hurricane Sandy and was partly closed for repairs until shortly before last summer. Brian Squiteri, who lives nearby, said he arrived at the scene soon after the fire broke out. Mr. Squiteri described a chaotic scene, with residents of the motel running and screaming and banging on doors on the ground floor. Ms. Wardell, who said there were several others displaced by Hurricane Sandy in the motel, said they had no option but to get on with finding a new home — again.